Casa Vega, Los Angeles’s landmark 61-year old Mexican restaurant, invites young Angelenos to cool off with a cold treat compliments of second-generation owner Christy Vega. 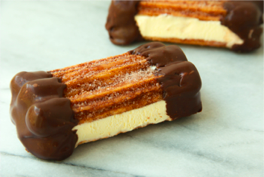 Timed with National Ice Cream Sandwich Day on August 2, 2017, children visiting the family dining destination will be surprised by a complimentary churro ice cream sandwich, with order minimum of a Casa Vega kid’s meal. A favorite dessert of Christy’s four young sons, the chocolate-dipped churros sandwiching vanilla ice cream adds a sweet ending to any family lunch or dinner. Credit: Casa Vega is a family-owned Mexican restaurant that has been a Los Angeles landmark for 61 years and an iconic stomping ground for Old Hollywood’s biggest stars, from Marlon Brando, Carey Grant, and Jane Fonda. Opened in 1956 by Rafael “Ray” Vega, Casa Vega serves authentic Southern California Mexican food and drinks in a warm, festive atmosphere. Today Ray’s daughter, Christina “Christy” Vega (as seen on Food Network’s “Guy’s Grocery Games,” NBC’s “TODAY” Show, CBS’s “This Morning,” ABC’s “The View,” and more) is at the helm of the time-honored restaurant. From delectable dishes such as traditional chicken mole, burritos, enchiladas, and tostadas, to tasty house-made margaritas and mojitos, Casa Vega features an extensive and time-tested menu. For more information, please visit www.casavega.com or find Casa Vega on Facebook, and Instagram.